Tom Yum is a clear, hot and sour soup. These two dominant flavors come from the omnipresent chili and the combination of lemongrass, kaffir lime and lime juice. To give it all even more distinct taste, fish sauce and galangal are used. 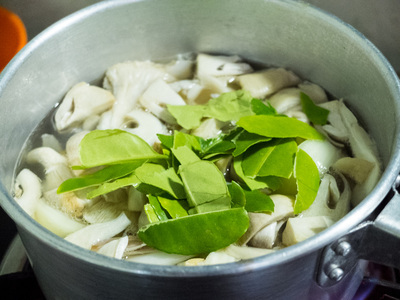 Galangal is a root, similar to ginger, with a pungent smell and sweet chili taste (it reminds me of horse radish).Tom Yum soup comes in many varieties, depending on tastes, you can add different types of meet or fish to it. 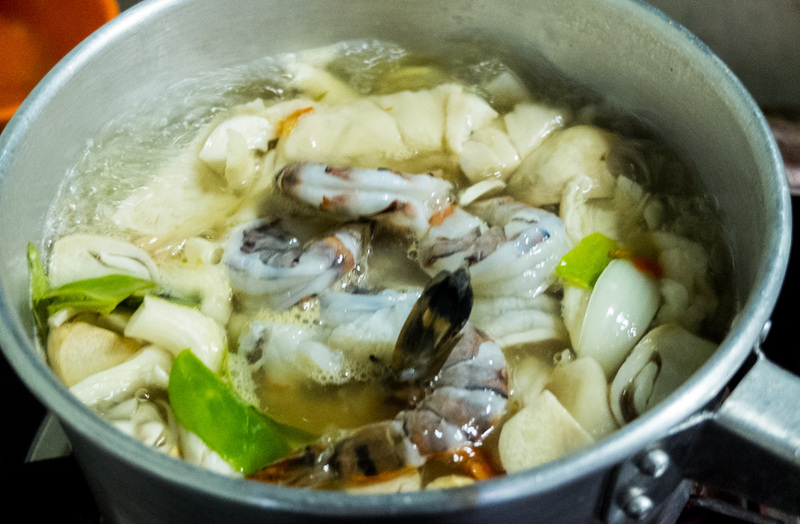 However, one of the most famous versions is the Tom Yum Kung - with prawns. 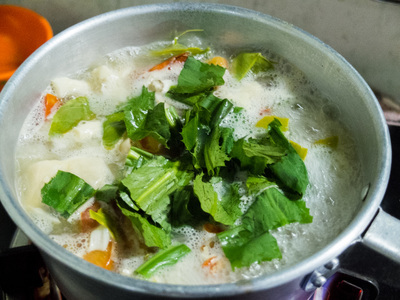 I'm crazy about this soup and now that I have discovered how to dose its mysterious ingredients, I can make it at home! 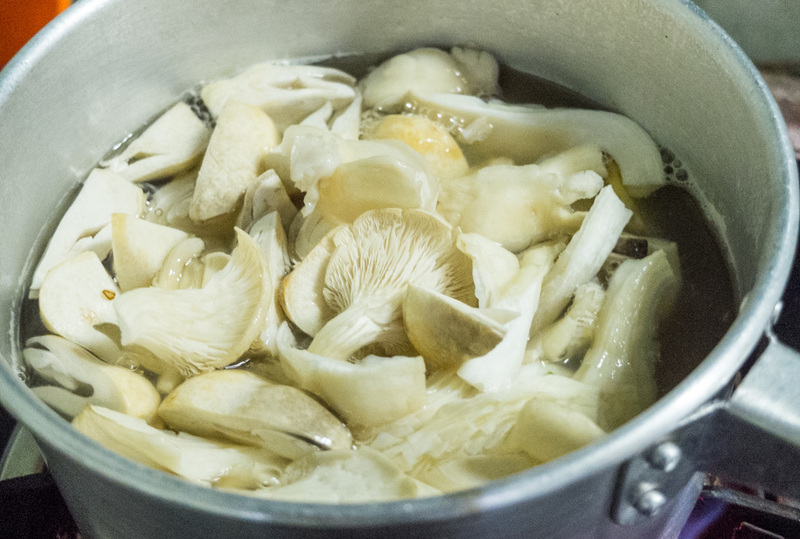 Take a thick bottom pot and put 400ml of water to boil. Meanwhile, cut the mushrooms in big chunks, cut the galangal in round slices, diagonally cut the lemon grass, squeeze the juice from the lime fruits and chop the fresh chilies. 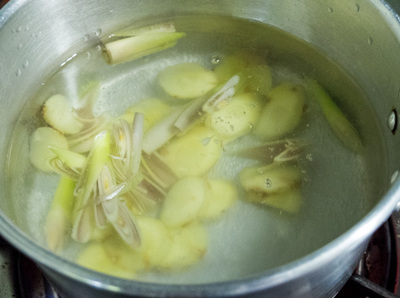 Once the water is boiling, add the chopped lemon grass, the galangal and salt to taste. Next, add the lime juice (ca. 5 tbs), the fish sauce and the chilies. Leave to boil for a few minutes. Then add the chunks of mushrooms, the chopped onion and crush the kaffir leaves with your hands before adding them to the soup. Finally, add the shrimp and the tomatoes (the latter is mostly used to give some color to the soup) and leave to simmer for about 3-4 minutes, making sure not too overcook the shrimp. Turn off the gas, add the finely chopped fresh coriander leaves and your Tom Yum Kung is ready! PS: chili and lemon quantities can vary, all depending on one’s tastes. 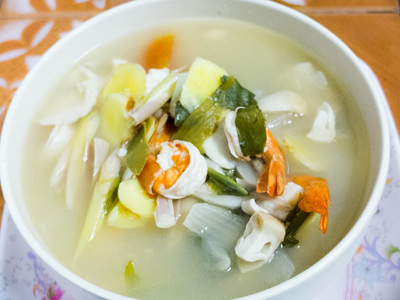 In north of Thailand, for example, you would use 2-3 chilies, but in the south, that is famous for its very hot food, they’d use even up to 8-10 pieces. Lime quantity depends on the grade of sourness you wish to obtain, so, also here, follow your own taste buds.